Room Hunter is a cloud-based app that allows employees to instantaneously find available meeting rooms without leaving their desks. The inspiration behind Room Hunter actually stemmed from a real dilemma in GlobalLogic’s Argentina offices. After roaming the halls looking for an available meeting room, employees were discovering that many of the meeting rooms marked as “booked” on GlobalLogic’s calendar app were actually empty due to cancelled or shortened meetings. This frustrating experience led a group of employees to develop an application that uses information from in-room sensors to “see” if a room is physically occupied. 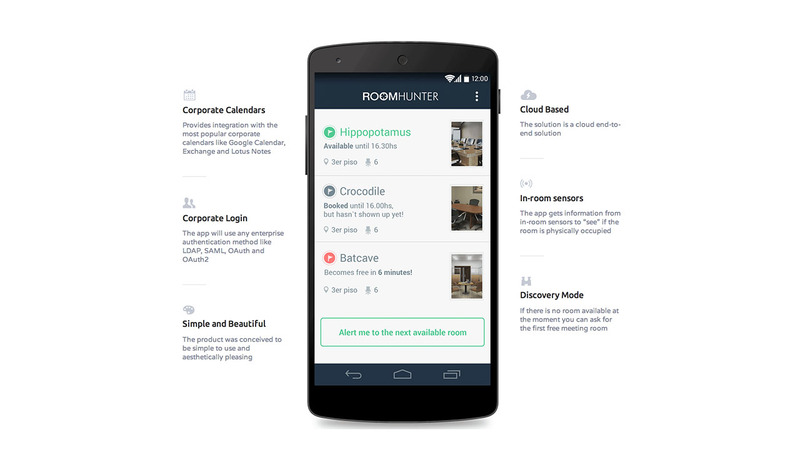 The Room Hunter app provides a detailed view of a room, lists its amenities (e.g., seats, whiteboards, projectors, etc. ), and identifies who has booked the room and for how long. The initial version of Room Hunter was an Android mobile app that enabled users to book an available meeting room on-the-fly without accessing GlobalLogic’s calendar app. However, without information on what was actually happening in the room, the app had limited value. This gave rise to the idea of including sensors that could connect users to a new level of information about the meeting rooms. The concept was well-received by Facilities Managers at GlobalLogic, who realized they wouldn’t need to build more meeting rooms if the existing rooms were used more efficiently. The current version of the app has four main components: mobile app, sensors, cloud platform, and back office portal. The motion sensors combine a PIR sensor and a microphone connected to a Raspberry Pi. The cloud platform uses Apache Kafka, Storm, and Esper to create a highly scalable and rule-based platform to interact with the mobile app API. This robust app not only syncs to corporate calendars such as Google Calendar and Lotus Notes, but it also allows for corporate login using any enterprise authentication method (e.g., LDAP, SAML, OAuth, OAuth2).The proof-of-concept was developed in Argentina over a period of three months through the collective efforts of local UX designers, big data engineers, Java architects, Java developers, and embedded software engineers. Because Room Hunter makes it very easy for employees to find available meeting rooms, the app has significantly boosted GlobalLogic’s workplace efficiency. In the future, this solution even has the potential to help companies go green. By turning off lights and climate controls when a room is idle, Room Hunter can help actuators reduce an organization’s power consumption—making it more than just a smart way to find a meeting room.